A detail from the cover of the 1937 Pattullo Bridge souvenir programme. Scans provided courtesy of the Burnaby Village Museum. Thanks to Lisa Codd, the curator at the Burnaby Village Museum, here’s a special history treat to celebrate the Pattullo Bridge reopening this week. 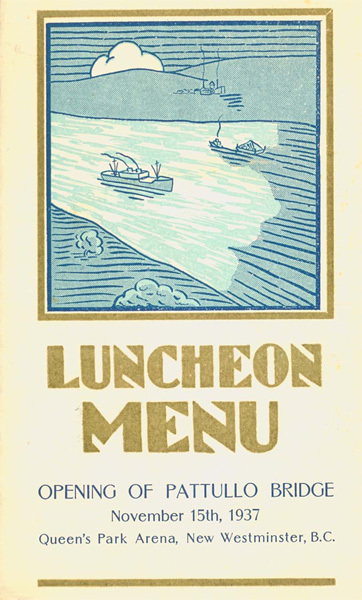 It’s the souvenir programme and luncheon menu from the 1937 opening of the Pattullo Bridge! I’ll run through some of the highlights from both in this post. I’ve also got some great historical background from Lisa to share with you! The bridge and two ferries that existed before the Pattullo Bridge. Scans provided courtesy of the Burnaby Village Museum. So, the programme provides some great detail on how and why the Pattullo Bridge was built in 1937. 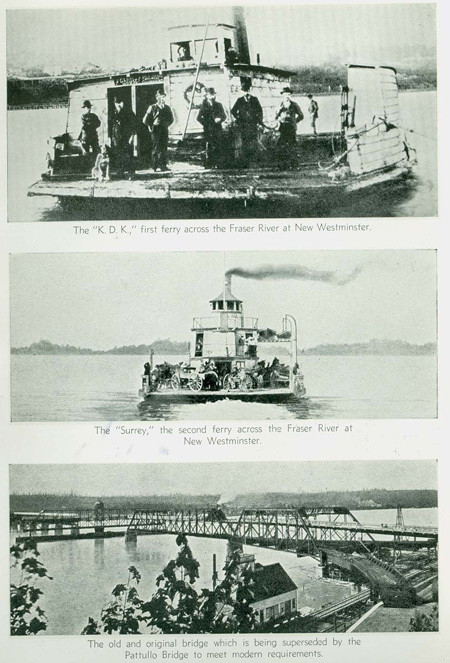 Fifty years before the Pattullo, the only way of crossing the river was through a ferry called K.D.K. The K.D.K. started service on March 17, 1884, running every two hours during daylight, with a capacity of two teams and wagons. Of course, traffic was soon too much for the old K.D.K., and a new ferry called the Surrey was built to handle the higher volumes. Still, a farmer living more than 20 miles from New Westminster needed about three days to complete a return trip to market – so the clamour began for a bridge across the Fraser. So, in 1902, the precursor to the Pattullo was built over the river. This bridge opened in 1904, but as the programme writes, “the demands of modern highway traffic ultimately exceeded the capacity of the structure.” Construction then started on the Pattullo Bridge in 1936, which finally opened in 1937. 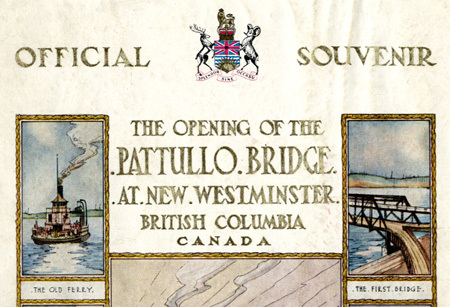 A photograph of the Pattullo Bridge upon completion, from the centre of the souvenir programme. Scans provided courtesy of the Burnaby Village Museum. Did you notice the autographs on many of the pages? Lisa tells me that autograph books were a popular item with young people dating back to the late 1800s and early 1900s. Collecting autographs from celebrities in the 1930s was undoubtedly a continuation of that trend. The luncheon menu illustration of the completed bridge. Scan provided courtesy of the Burnaby Village Museum. Now onto the luncheon menu, which is a lovely folded piece. Have a look through and you’ll notice that as you unfold the menu, the illustrations show different stages of the bridge construction. It goes from no bridge… to parts of the bridge… to the completed span in the centre. The luncheon was held at Queen’s Park Arena in New Westminster, which opened in 1930. Highlights from the meal include clear beef broth sherry and cold ox tongue – yum! You’ll also see on the centre page of the menu that the orchestra at the luncheon was Mart Kenney’s Western Gentlemen. (It actually says Mark Kenney, but that’s definitely a typo). Mart Kenney’s orchestra was the top dance band in Canada in the 1930s and 1940s — you can find out a bit more about him at the Encyclopedia of Music in Canada. As well, Mart’s wife Norma was also very famous in her own right as a singer. Where did this programme and menu come from? The programme and menu are both are part of a collection donated to the Museum by the family of William E. Grieve, a long-time Burnaby resident. Grieve moved to Burnaby in the 1920s and owned a car dealership on Hastings Street. He was a Liberal candidate in the provincial election in 1937, and while he was unsuccessful in that election, he did receive a personal letter from T.D. Pattullo, thanking him for his effort in running in the election (Pattullo, of course, was the Liberal Premier of BC from 1933 to 1941, and is the namesake for the bridge). Mr. Grieve no doubt received an invitation to the opening because of his support for Pattullo. He was eventually successful in running for Burnaby School Board in 1942, and served on the school board for 15 years. And a bit about the Burnaby Village Museum: if you don’t know about it already, the Burnaby Village Museum is an open-air museum that recreates life in 1920s Burnaby. It’s currently closed, but will open again for spring break on March 16-22, and for the summer season on May 2. Check the museum’s website for admission costs and more. And thank you again to Lisa for sharing such wonderful artifacts with all of us! The road bridge that opened in 1904, surviving until opening of the Patullo Bridge in 1937, was built as a double-deck rail/road bridge. The rail level still survives as a major bottle-neck in the region’s rail network. It is used by the Amtrak train to/from Seattle, and a lot of freight traffic. So if you think the Patullo Bridge is outmoded, have a look down at the rail bridge next time, unless you’re driving and focused on those 10-foot traffic lanes! The rail bridge also carries the Via Rail trains from Vancouver to points east (as far as Toronto). Let’s hope the replacement Pattullo Bridge also carries two railroad tracks. Rail transport is definitely the greener way for longer distance transport, for freight and for passengers. The rail bridge below the Pattullo carries upwards of 20 – 30 trains of seven carriers per day, 365 days per year. The bridge is a definate choke point in the Lower Mainland rail system. It is a vital link to the Canadian export economy as that rail line leads to the Port of Vancouver (north and south shores). Grain sulphur, potash overseas containers etc, are transported across the river here. The rail line connects with the North American rail network via Seattle and Canadian points east of Vancouver. The bridge has a somewhat colorful past as it was struck by a runaway barge in December 1975, knocking the north span into the river and caught fire in May of 1982. I found a typo in the luncheon menu. The band playing was the Mart Kenney (not Mark) Western Gentleman’s Orchestra, a very popular band at the time. Mart played concerts right through the 1990’s. He died just a few years ago in Mission, BC. Thanks Alan — I noticed that too! If you have a look at the middle of this post I also have a couple of links about the history of Mart’s band and the biography of Mart’s wife, Norma Kenney. Here’s the answer according to Chuck Davis, a local historian — I found it in his timeline of Vancouver-area history. There was a toll on the bridge of 25 cents which was not removed until February 12, 1952. My mother, Margaret (Peggy) Clark, was May Queen in New Westminster when the Patullo Bridge opened and I have been told that she participated in the ceremony. I would like to see photographs of the opening to see if I can spot her in any of them. Do you know how I could access such photos? Are there any photos of workers building the bridge or painting the bridge? My great-grandfather was one of the workers and to have any photos of people working on the construction and painting of the bridge would be phenomenal.